One of the major stumbling blocks for draperies is finding the right rod for the right price. Especially when you are trying to find a rod that is ten feet long! Here is a great DIY option for an otherwise budget-breaking project. 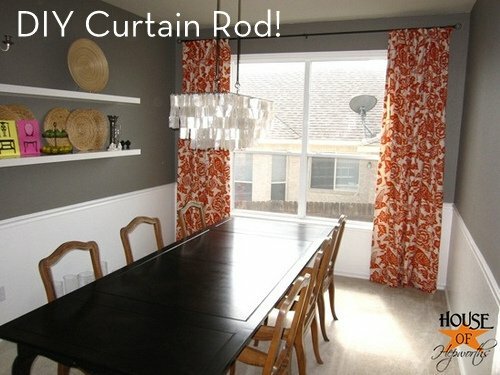 Allison at House of Hepworths invested a lot in the perfect fabric for her dining room, and after scouring her hometown for an affordable curtain rod solution (and finding nothing she wanted for less than $150), she decided to make one herself. Since her window was 113" long and her fabric heavy, she knew that PVC pipe would probably bow with the weight. Her solution was metal electrical conduit, which came at the serendipitous price of $2 for ten feet. Adding on paint and finials, her total came to less than $10 for the entire project! For her full instructions, visit House of Hepworths. So Excited that I found this. Have had curtains tacked to the window frame for months because I cant seem to justify spending so much on the rods!! Thank you! For once, I've beaten Curbly to the punch. Been using that trick for years.